With the aid of your computer, you can access databases of all kinds to dig up reams of material—government records, business and financial info, airline reservation services and schedules—almost anything under the sun. The only downside, in the majority of cases, is the cost: many services charge an arm and a leg for this availability, breaking it down into "per minute" rates. And since virtually all of these services are laid out in a unique manner, often employing hard-to-learn command structures, many times you're left spending a great deal of time looking for the information you need. An alternative system has started up, based in Colorado, that delivers the news and financial data in real-time right to your door—or more aptly put, through your serial port and right up to your computer screen. More importantly, it doesn't tie up your phone line, as is the case with other services of this genre. X*Press, as it is called, is delivered to your computer by way of a standard cable television line (provided your local system offers the service) or by satellite dish—at a whopping 9600 baud. We'll discuss the choices in the methods of transportation later; first, let's look at what X*Press is. X*Press is akin to having a news ticker in your home. Through it, you can scroll through story after story from a wealth of sources, both national and international. In addition, you have access to stock prices; all you need to do is set up a portfolio of up to 128 stocks by their symbols and the software automatically updates the current price, high and lows up to that time, and charts up and down arrows as "ticks" for monitoring the latest activity of the stock. This is invaluable to both the dabbling and the experienced investor. For the news hound X*Press is equally powerful. With tons of sources, you can keep up with current events easily. This not only includes national coverage, but imported stories from international news bureaus in many countries. X*Press Information Providers (IP) include such big names as McGraw-Hill, Associated Press, United Press International, and Cable News Network, as well as international sources such as TASS (Russia's news agency), Xinhua (China's news service), and The OPEC News Agency. New IPs are added frequently to keep the service expanding. Of course, the X*Press service isn't restricted to such serious topics as financial information and current events coverage. You'll find other sections pertaining to sports, weather (both stateside and international reports), entertainment and shopping, among others. Within these areas you can find such diverse text as movie and book reviews, horoscopes and computer chat. There are also two subjects that deal more directly with X*Press itself. The first, "Inside X*Press," has sub-categories that inform users of the latest features and additions to the service, hints and tips, and commentary on the system. The other category is "Information X*Change." This is a two-way conferencing service, allowing X*Press users to speak their mind on topics of import under such topic headings as Inside Your Head, Teen Talk and Computers & You. Now you might wonder how a seemingly one-way system, as X*Press is, can become a forum for discussion. X*Press has set up a number of methods for its subscribers to pass their comments along: 1) Comments can be sent by mail; 2) comments can be relayed through their toll-free phone number, after which they will then be transcribed and posted; 3) X*Press′ "mailbox" can be called by computer and the text of your comment uploaded. (This is a toll-call to most of the nation); and 4) you can call X*Press' mini-BBS, which is accessible through a local phone connection via Tymnet. In addition, Linda Nicholson, X*Press's conferencing coordinator; said that they plan on expanding the service to offer a toll-free data line that you can employ to upload your comments. The best feature of X*Press is the ability to tailor the software for what type of news you are most interested in. Through the category selection process, you can move from menu to menu picking which topics and sources you want to receive data from, and the software will toss into memory all stories that meet those criteria. It's somewhat like having a custom-made newspaper delivered to you at whatever time you choose. In the Category Selection menu, there are listings of major areas of interest: Finance, Business, News, Sports, Weather, Lifestyles, Entertainment, Tech Talk, Shopping, Information X*Change and Inside X*Press. If you click on a category, you'll also get a list of sub-categories; for example, the Inside X*Press category has sub-categories of Bulletins, News, What To Watch For, User Tips and New Services. Certain sub-categories have indicators next to them that indicate a sub-sub-category, such as the state-by-state list under the USA State listing in the Weather category. All this procedure does is to narrow down what your focus is, which serves to trigger the software to flag any stories within those specified sections and pop them into memory. Once you go through the entire selection process and have configured the software to the areas of interest to you, clicking on Save Settings will write those selections to a configuration file on the program disk. This will ensure that the same settings are loaded in each time you run X*Press, though you can change at anytime within a session. The stories can be pulled up at any time for scanning by selecting the Display header from the menu bar. You can show all stories in the display window, or pick a specific category to view. 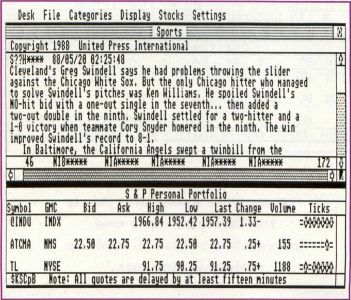 You can also bounce back and forth between the window for story viewing and the window that holds the stock listings. As long as the program is running, it will keep receiving stories and stock figures, refreshing the number of stories until the memory is filled to capacity. I've had the opportunity to see the preliminary versions of the ST software, basically from the start of testing, and watching that evolution tells me that it could be the most feature-filled link to X*Press to date. The ST version programmed by Alan Page—who's best known for his work as co-author of the popular and powerful terminal software, Flash—has included many innovations. Thanks to the speed and memory capacity of the ST, Page had the room he needed to make the X*Press and ST pairing very versatile. Here's a glance at what is possible on the ST version of X*Press that isn't available to other PC versions. In other versions, you can enact a keyword search for any or all of 16 keywords (from a list you set up) appearing in the stories in memory. 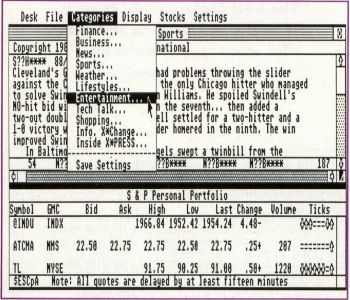 As an example, when the Oscar nominations were announced, we activated the software (using an in-house IBM PC in this instance) to flag stories in the Movie subtopic in the Entertainment section. Later, we had the software scan through the existing stories in memory for any occurrences of the word "Oscar," exactly as you would do with the Search command in a word processor. In the other versions of the software, any story you look at must have had its category previously selected, and you must be insightful in your choice of categories so your keyword search will be lucrative. In fact, the first showing of the Oscar listings we were clamoring for came down the line on the French press in the News category, not from the Entertainment area, as we expected. In a more important, and possibly timely, situation—such as hoping for speedy information on a possible business takeover of a company, which may drastically affect the price of a stock—not knowing what category a potential story will reside in could become a major stumbling block to your search. While the ST software has a similar keyword option as that mentioned previously, the ST's speed also permitted Page to expand on the keyword segment with what is called a "clipping folder," to poll all stories coming down the line for keyword matches. The main benefit to this is that you can get stories of particular interest to you, without having to first figure which categories that word might appear in. There are two separate clipping folders, and you can choose up to eight keywords to search for in each folder, with some options for comparing keywords—like Time AND Inc., or Oscar AND NOT Grouch. You also can set it up to take into account matches in upper and lower case if you choose, so using "Time" as a keyword would more likely point to text on Time, Inc., as opposed to just any occurrence of the word "time." Using the prior example, with the ST version you could plug the word "Oscar" into the keyword list of the clipping folder dialog box. 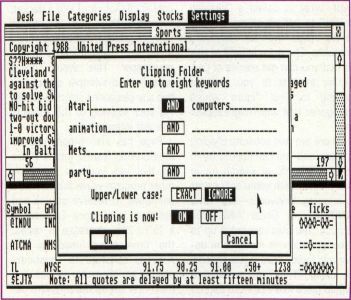 Then the software would grab all stories that contained that word into a packet, separating them from the regular story acquisition, just as you would if you were clipping stories from a newspaper. This would occur regardless of whether or not you had any categories selected, focusing your viewing to the subjects you are interested in. Page has also programmed a multitasking feature into X*Press ST that lets you run most any other program while the software continues to receive stories and put them in memory. The cost is a 15 to 20% decrease in speed, the time being used by the X*Press software to constantly poll the serial port for stories. You must first set up the software before running it, to allocate a smaller chunk of memory to X*Press′ capture buffer. This will reserve some of the RAM to the other application(s) you plan to run, be it word processor, spreadsheet or game software. Again, the X*Press program will continue to monitor the data feed in the background of the application you run, although the smaller storage area will limit your story acquisitions somewhat. There's no doubt that this won't be as much of a limitation once users expand the internal RAM of their STs to a point beyond one megabyte or when more Megas are purchased. To aid the ST user further, Page has added text compression to let more stories fit in memory. Actually, X*Press is broken down into two different services: X*Change and Executive. The main difference between the two is in how much "white-collar" data you want to receive and how much you want to pay for it. Executive offers two other categories that X*Change doesn't have, Business and Finance, and lets the stock investor track a portfolio all day (with a 15-minute delay); X*Change updates the stocks for its users at the market's opening, midday and closing. The other difference is in cost, with X*Change being offered as a "basic," no-monthly-charge service and Executive being charged at a recommended $19.95 a month. Each service requires the purchase of a kit which contains the software particular to your computer brand and hardware to convert the signal coming off the cable into a data stream readable by your computer and the X*press software. The package even contains a file-transfer program, so you can keep your software current and receive the new categories X*Press offers. X*Press schedules occasional dates and times (done at night to minimize your loss of the service during prime times) for file transfer. You set up your computer with the file-transfer software running, and when X*Press starts the transfer, a coded packet is received, and the files are saved to disk. Checksums are employed and error counts are tracked to verify an accurate download. There's no doubt that this is the future of news and information retrieval, and the variety is immense. One other variation to the story is what you can do with this information once you get it. Some packages already exist for the IBM compatibles allowing you to export the data to other software, such as a spreadsheet or word processor. The ST version has a menu selection for loading in or saving out stories to disk in ASCII format. But the largest potential is as an educational tool. If each school had X*Press, you'd have a real-time news source for current events, stock and finance information for accounting classes, and even a source of Spanish language text with Notimex, the Mexican news service. The Information X*Change is a great venue for keeping up with sentiments of others around the country. They also have a program called X*Change in The Schools, that provides free software/hardware kits and support materials so that educational facilities may benefit from the resources the connection brings. Once X'Press, like the cable TV wires themselves, is exposed to a large volume of the country, we'll see them becoming a force in education—perhaps as much a part of the educational process as a textbook. X*Press has just started marketing their service more heavily, so you may not have it in your area as of yet. For those with TVRO (TV Receive Only) satellite dishes, X*Press also offers a kit for getting their signal. The difference is in the additional hardware required and the subsequent added cost. For cable systems, the addition of equipment to the already existing hardware is minimal and reasonably inexpensive in most cases. Therefore, X*Press is finding itself in more cable systems each day—they claim to be in over 480 systems, passing over 5,000,000 homes. If your cable company doesn't currently carry X*Press, give them a call, or contact X*Press directly at 1-800-7PC-NEWS (772-6397). You'll be getting in on a chunk of the future.